Crustaceans are arthropods that inhabit bodies of water and terrestrial areas throughout the world. A majority of these arthropods are marine, or saltwater dwellers, though some varieties live in freshwater. Land dwellers are found on forest floors, in sandy dunes and on the bodies of living hosts. Exoskeletons and segmented bodies are characteristics of these invertebrates.They are as diverse as they are plentiful: Authoritative estimates of crustacean species vary between 40,000 and nearly 100,000. Crustaceans' hard exoskeletons, called carapaces, serve to protect their delicate, segmented bodies. The head, thorax and abdomen are segmented and the legs are jointed in two or three sections. Crustaceans also have six to eight legs, and antennas on their heads that are used to navigate in their environments and sense location, potential danger and food. These fascinating arthropods also have eyes that are situated in the center of their heads, often on long, tubelike structures. Many people think of the sea when they think of crustaceans. This is probably because most crustaceans are marine-dwellers. Marine crabs make up one of the largest groups of crustaceans, with approximately 5,000 species. Hermits, fiddlers, blue, king and sand crabs are some of the commonly known varieties. Sedentary barnacles are crustaceans that live attached to boats, rocks and even other animals in bodies of saltwater. 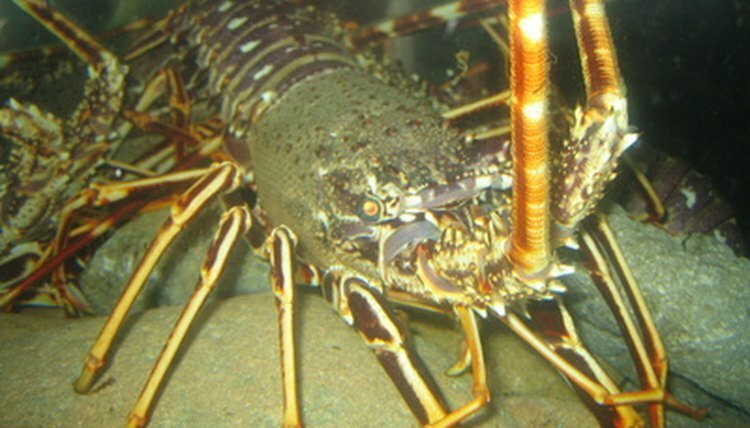 Lobsters are large predators that live in saltwater from tropical to arctic seas. Small saltwater crustaceans that include krill, prawns and sandhoppers scavenge the ocean floor. The most common freshwater crustacean are crayfish. They're in lakes and ponds of all sizes, in rivers and creeks and streams and ditches. Freshwater shrimp and crabs exist in such environments, often smaller and less colorful than their saltwater counterparts. Crustaceans that live on the land have evolved slightly differently than their aquatic ancestors. Because they need water to eliminate waste materials and maintain body temperature, land crustaceans morphed over millions of years to use water in the environment for this purpose. Their hearts, stomachs and gills act in unison to regulate water in their systems, whereas water-dwelling crustaceans rely on gills and constant water immersion. When it comes to the similarities between aquatic and terrestrial crustaceans, various types of lice, pill bugs and even some small land crabs have segmented bodies and exoskeletons just like their water-dwelling cousins. Lice varieties such as wood lice are parasitic in nature and feed off hosts such as animals or even humans. Most crustaceans reproduce sexually with a separate male and female. Most females lay eggs that hatch into free-swimming larvae, though some crustaceans such as shrimps hatch into tiny versions of adults. However, most young reach adulthood through several stages of metamorphosis. Barnacles are hermaphrodites that reproduce asexually, which means that a single barnacle produces egg and sperm. Though crustaceans are protected to some degree by their durable exoskeletons, these arthropods are prey to many types of predators. From sea mammals to birds to fish to other crustaceans, life often ends for crustaceans when they become meals for other creatures. However, humans may be some crustaceans' worst enemies, as many varieties of shrimps and lobster are dietary delicacies in cultures all over the world. The diet of crustaceans vary greatly depending on the size and variety of the animals. Small, terrestrial varieties often survive on a diet comprised of organic matter from decaying organic matter. Parasitic crustaceans feed off the blood and skin materials of their host animals. Smaller aquatic crustaceans eat microscopic organisms, algae and plankton, while their larger counterparts enjoy diets of snails, plants and the larvae and eggs of other marine life. Large lobsters and crabs survive on fish and other crustaceans with a predatory nature that involves stalking their prey. The life expectancy of crustaceans varies greatly from species to species. Small varieties like krill, prawn and shrimp have many predators, so many never make it past larval stage. These tiny aquatic dwellers that do make it to adulthood may live one to two years, which is similar to their terrestrial counterparts. Larger crustaceans like crabs and lobsters may live two to five years, though those in captivity such as hermit crabs may live a decade or longer. Some large lobsters have been known to live as long as 50 years in captivity. Crustaceans are common in the fish tanks of aquarium hobbyists. Freshwater crabs and shrimp are popular aquatic pets that help keep tanks clean. Fiddler crabs are semiaquatic pets that enjoy a terrariumlike setting with sand, plants and water. Saltwater lobsters and crabs such as arrow, blue and porcelain crabs are favorites of hobbyists who have saltwater reef aquariums. The hermit crab is among the most popular crustaceans pets. He thrives in a moist, sandy setting. Hermit crabs come in a variety of colorful shells they've scavenged. They are hardy little pets that have been known to live several decades with proper care.